Local filmmaker, musician, visual artist and humanitarian, Jenny Graf Sheppard, has lived in Baltimore for about eight years. She began her artist career as a painter, but soon realized it to be a restricting medium for her goals in exploring ethno-graphic and social issues. She then turned to film as a way to be more dynamic in her self-expression and personal investigations. Sheppard turned from documentary to experimental work, wanting to be poetic instead of purely informational. 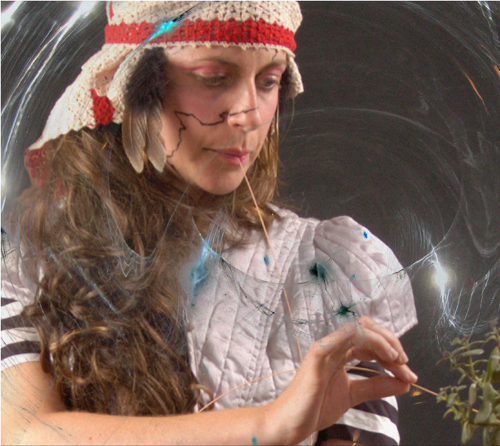 As an artist, she always tries to find new ways to immerse the people into a sensory experience. One very notable piece she did was for the annual High Zero Festival in 2008. She installed an experimental piece entitled, “Threshold of Sound and Action,” which “involves musicians, servers and diners. The ordering of specific foods triggers specific sounds which, in turn impacts the way in which food is served. Also involved is a ‘manager’ who directs the servers to behave in various ways based on hand gestures. The result is a dining event in which not everyone ends up getting what he or she ordered. 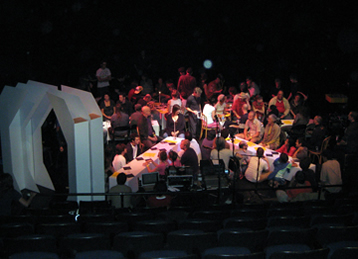 The social convention of dining out is shaped by the composition of elements in this work.” Having the audience be a part of this highly unusual dining experience allows Sheppard to really engage people to rethink the possibilities of even the most ordinary event as public dining. It is apparent that Sheppard is able to see the mundane in a creative light and create a world that challenges conventional perspective through sounds and visuals. Jenny Graf Sheppard certainly addresses and reformulates conventions in her independent film, “Proud Flesh.” She worked on the film with fellow musician, Chiara Giovando, for a couple of years. The film was borne out of an album they made of experimental electronic music. They thought about the West while making their album and when they were finished with it they could envision landscapes in their mind. So inspired, they decided to transform their music into a soundtrack to an experimental western while also experimenting with the manipulation of diegetic and nondiegetic sound to take the place of dialogue. To Jenny, “making sound is like weaving a quilt,” and she carefully synthesized various sounds to take the place of words within her virtually silent film. Other factors that motivated Sheppard to take on the project were her recent fascination with old Westerns, such as The Great Train Robbery, and westerns that reinterpreted the western, such as Little Big Man. Something else that influenced Sheppard was her past visit to the very historical and spiritual Badlands of South Dakota –a place that enchanted her so much she was looking for an excuse to go back –and her interest in the figure of the older woman in unexpected roles, such as that of a gunslinger. All of this circulating in Sheppard’s mind compelled her to make her innovative western film when finally given the opportunity. Proud Flesh, as described in The City Paper, is a “a hypnotic, abstract, and allegorical western” as well as a “a non-narrative movie that both embraces and refutes the conventions of the western genre.” The film embraces the genre with its sweeping South Dakotan landscapes and use of completely authentic sets in “1880’s Town,” (a tourist attraction which is a hodge-podge of old, western ghost town buildings). It refutes the genre by casting older women as the protagonists. Sheppard and Giovando asked their mothers to play the two main roles. 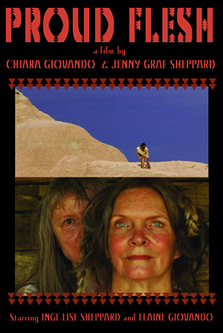 Sheppard’s mother plays the role of the injured, wandering gunslinger named Harrius, while Giovando’s mother plays the more domesticated townsperson. It is unusual to see a woman approaching old age playing a role usually portrayed by rugged, young men. However Sheppard likes “locating agency in new places in terms of gender and age,” old women especially interest her. She believes that there was once a time when female figures were more revered and prioritized, instead of the mainly patriarchal society we live in now. Sheppard is attempting to revitalize the importance of the female in Proud Flesh. 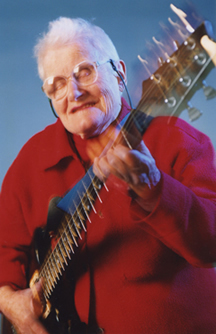 In addition to her innovative approaches to music therapy and filmmaking, Sheppard finds an importance in the idea of community and collaboration. Throughout the making of Proud Flesh, Jenny’s cast doubled as the crew, comprised of mostly local Baltimore artists –including Tom and Dan of Snacks. Everyone came together to assist in the acting, the filming, the sound, the construction of the cocoon-web Harrius is caught in, and the scouting of a bank in West Baltimore in which the bar scene was shot (this was the only scene not shot in South Dakota). Sheppard views her film as evidence that local collaborations can function in a larger work, such as a film running over thirty minutes –not just a song or short video. The difficulty in taking on a larger project, however, is the lengthy amount of time is takes to complete it so, as Sheppard put it, “You’re changing and so is the film, so you have to keep up with it.” Jenny Graf Sheppard provides living proof that the boundaries of western film conventions, female societal roles, and long-term artistic collaborations can all be pushed further and have successful innovation come as a result.